Adding weight to your driver may improve your game off the tee. Numerous golfers, from pros to recreational hackers, have added weight to their drivers or other clubs for years. They believe that adding weight to clubs can affect a golf shot’s path or its trajectory, but equipment experts will tell you the results are psychological. In reality, the amount of lead tape typically added to a golf club has little, if any, effect on the ball's direction or trajectory. But if you believe, as tour pros like Phil Mickelson does, that lead tape can help your game, don’t add tape during competition. The Rules of Golf permit players to add tape to clubs before, but not during, a round. Place a strip or two of lead tape beneath your driver’s toe (the outer portion of the clubhead, opposite of the clubface) if you have a tendency to hook the ball from right to left (for right-handed golfers). You can also try adding the tape to the outside of the toe. The added weight on the outside of the clubhead prevents it from moving too quickly, relative to the inside of the clubhead. Add lead tape to the bottom of the driver’s heel (near the shaft) to prevent or minimize a slice. This has the opposite effect of placing tape on the toe. Adding tape to the heel makes the toe relatively lighter so that it moves quicker, helping the golfer square the clubface on impact. Many recreational golfers find it difficult to square the face of larger clubheads, such as drivers, often causing a slice (a curved shot from left to right). Add tape to the back of the driver to change its center of gravity. A lower and deeper center of gravity helps the player gain greater loft. 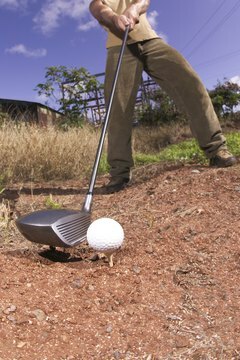 Typically, a driver’s center of gravity is low and fairly deep in the clubhead, a bit toward the toe. Try adding tape onto the back of the clubhead, a bit toward the toe side, to push the center of gravity deeper within the clubhead. Place some lead tape near your driver’s grip to counterbalance the club. If your driver's clubhead feels uncomfortably heavy – perhaps because you’ve switched to a driver with a lighter shaft – adding some weight near the grip may help the club feel more balanced. Golf legend Jack Nicklaus is among the pros who have employed this technique by adding lead tape beneath the grips of his clubs. Buy a driver with movable weights. These clubs may not literally add weight, but the principle is the same as adding tape. Clubs with movable weights typically have ports into which weights are screwed. To reduce a slice, heavier weights are placed by the clubhead’s heel, while the club’s lighter weights are set by the toe. Reverse the arrangement to reduce a hook. Just remember that under the Rules of Golf, you can’t change the weight configuration during a round.